So I made a game. It’s called End Boss, and you can play it here if you haven’t already. It’s 5-10 minute long, and it’s made entirely of words. If you like words, or slightly disturbing themes, or things that are just 5-10 minutes long then give it a try. If you’ve already played it you have a choice: either (a) go straight to the comments section of this post and angrily exclaim ‘It’s not really a game though, is it?’ or (b) keep reading for a few of my thoughts on the game. I approached End Boss looking to make a game about choice. You may be surprised to hear that, because as you can probably tell it’s a very linear game. The decisions you make don’t lead to loads of branching paths, or alter the game’s story in any real way. 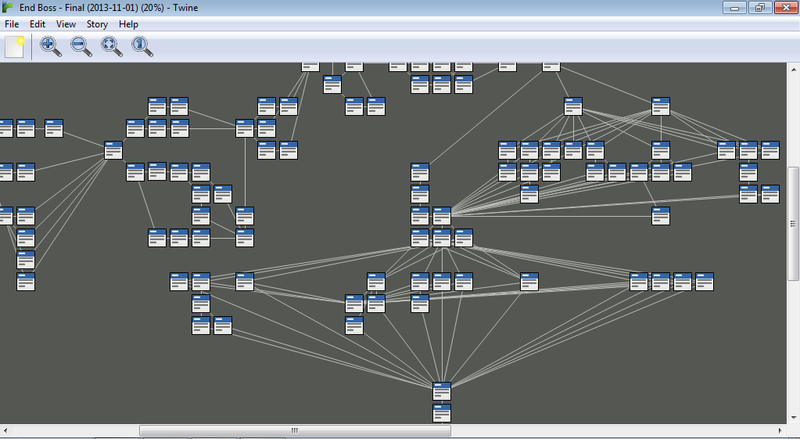 But that’s kind of the point – I wanted to make a game about choice rather than a game about consequence. I feel like most games that purport to offer players significant choices only really offer significant consequences. The decisions you tend to make as a player are interesting because of where they lead – which character you save, which city you choose to visit – and not because the choices are meaningful in and of themselves. What’s interesting, meaningful, important about the choices we make – where they lead us or what they say about us? Well both, clearly. Both are important, both are interesting, but games rarely put much emphasis on the act of choosing, so focused are they on crafting interesting consequences. From a purely narrative standpoint, consequences are often what makes a choice interesting. But from a human standpoint – a character standpoint – consequences generally aren’t all that important. It’s the decision itself that’s of interest; the context, the thought process, the mistakes and the weaknesses and the sheer humanity that goes through our heads when we think desperately about what to do. Think Sophie’s Choice, think Breaking Bad, think Telltale’s The Walking Dead. I wanted to make a game all about that moment of choice, one where the consequences of your choices are of secondary importance, or absent. 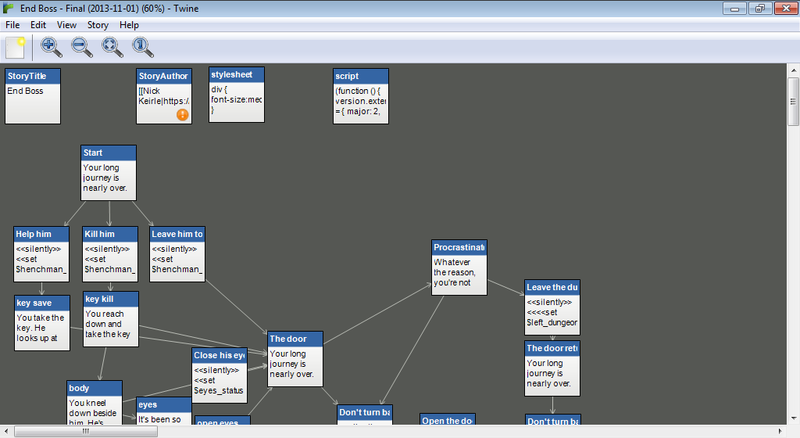 entirely In the end I decided to make a game not about choosing to do something, but choosing why you did something. End Boss tells you that your character some pretty awful things at some point in the past, and then asks you why. It’s not trying to make you feel personally bad for these things, because you – the player – obviously aren’t responsible. 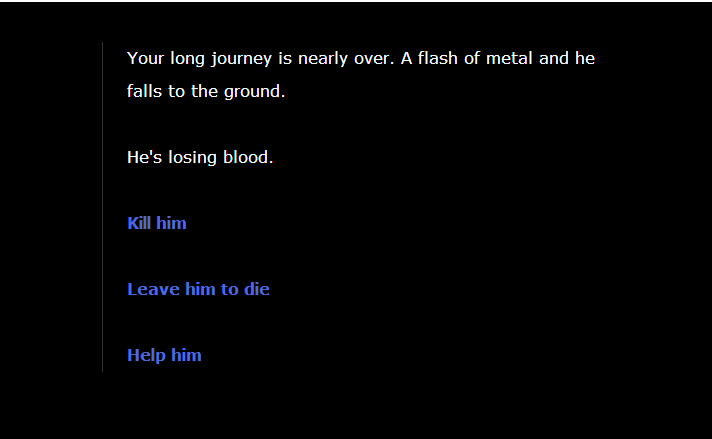 Instead it asks you to justify your character’s decisions as a way of building up your own personal narrative. The hows are unchanging, but the whys are up for grabs. Who is your character? Are they a cynical political manipulator? Do they believe themself to be a remorseless instrument of fate? Are they overcome with regret for their mistakes? Are they something altogether different, or more complex? Your choices in End Boss don’t determine much of what happens, but as the game goes on they do give you a pretty huge level of control over who you are. Not because of what you chose to do, but because of why you chose to do it. As a game it’s a reaction against the short shrift most games give to the act of choosing. You might notice that the only real action you can take in the game is deliberately given absolutely no context, and only really becomes meaningful later on, when you’re tasked with justifying the choice you made. But the game’s also a reaction against the way morality is presented in most games. You don’t choose your moral alignment or lose Morality Points by stealing gruel from a cute little orphan child. You don’t have a binary choice between becoming a shining paragon of virtue and becoming the moustache-twirling CEO of BabyHarm Inc. Instead it tries to get you to play around in the spaces between wholly good and wholly evil, and to come to your own conclusions about who your character is. Hopefully it works on some level, for some people. This is the first game I’ve made, and I knew that it was never going to be perfect. To be honest, I’m reasonably happy with it, even though it’s flawed, and the writing is scrappy, and it could be far better. But the core idea is solid, and I don’t think I did it too much of a disservice. Well, anyway, I hope you liked it. Here’s to the future, and here’s to improving. This entry was posted in Games Blather, My Games. Bookmark the permalink. Interesting experience, Nick (speaking as a non-games player). Lots of possibilities here. Well done. hi, have you played any games by Victor Gijsbers (he’s on IFDB)? He likes to explore choice in ways similar to what you’re talking about here. Hi George. I’ve been meaning to play The Baron for absolutely ages, but I keep forgetting because I’m awful. I’ll definitely give it (and Gijsbers’ other games) a look now. Thanks for the recommendation! 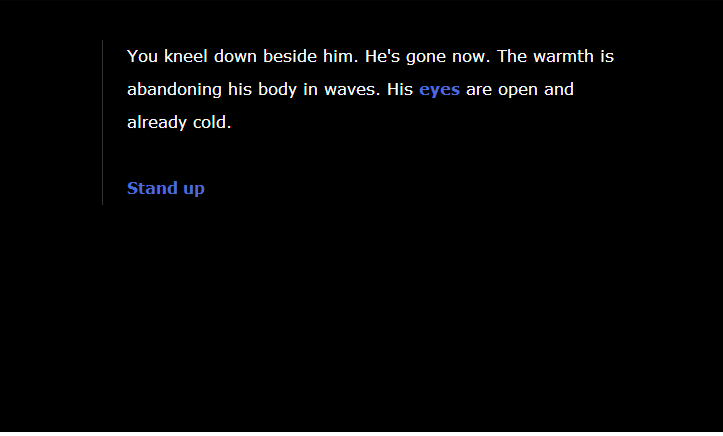 Wandered here through the link for “Character Creator” at IFDB.tads.org and I think “END BOSS” is fabulous. Already emailed a link to my narrative-loving friend. I loved being able to decided why things happened…but also that I can replay again and “be” a different character. Bravo! Before seeking out the author and this page, without knowing anything about it, I wrote a heartfelt review of “End Boss” on IFDB. I strongly suspected that it was a linear game, just as I guessed the author’s intent, but not until I had all but reached the final question. I didn’t have to think twice about its answer, either. I knew. I lied once though. I regretted fiercely allowing the barbarian to turn his back on me. On that day, there would have been more blood upon the snow. However, the author lied as well. You told us that “End Boss” was a game made entirely of words. If only all fiction, from video games to novels, could end so profoundly, so powerfully. 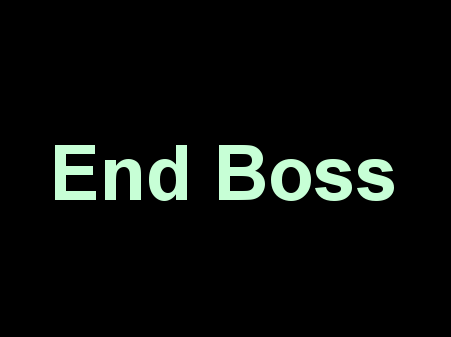 What is End Boss? It’s not just a story about a hero and the final confrontation of his or her quest. It’s a story about the player. Not the character—the reader, the real person at the keyboard making the choices. However, the story’s unspoken question echoes loudest. End Boss begs the reader to question their own heart. How far would you go to defeat your enemy? Do the ends really justify the means? Though he may never gain literary fame, Nick Keirle will go down as one of my all-time favorite authors. Hi Richard. I’m really glad you enjoyed it, and I’m completely bowled over by your kind review.